Every year the Casino Gorilla likes to bestow awards upon the best of online casinos – he is just generous like that! The feature award is the Best Casino of the Year, but there are also awards for the Best New Casino, Best Slot, Live Casino and Game Provider, among others. The awards are given based on the opinions of players plus the casino-lovers that make up our team here at Casino Gorilla Towers, although of course the final say always goes to the big hairy guy. (It’s always best to let him have the final say, no matter what the subject)! When it comes to choosing the Casino Gorilla awards, we don’t do things by half measures. Every eligible casino and game is subject to strict examination and testing by our online casino experts. We are a group of casino game fanatics – with the Gorilla the biggest of them all – and we know the difference between a great casino and a merely good one. That’s why we know exactly what to look for when it comes to judging the quality of an online casino. So, what exactly do the top casinos have to demonstrate in order to be considered for a Casino Gorilla award? Well, first and foremost all casinos live and die on the quality and quantity of games they offer, so that is a major consideration. We don’t just look at what’s on offer, we sign up and test out these casinos. Plus, we canvass veteran casino players for their opinions, ensure that the security features are up to date and make sure the promotions and loyalty plans are good value. After all that, the Casino Gorilla will throw in his two cents worth to help us to come up with an overall winner. From all the many online casinos that we reviewed in 2019, one clearly came out on top of the bunch: Casumo Casino. Since it was founded in 2012 Casumo has been single-handedly changing the way we think about online casinos. With its innovative design and unique style, Casumo has been setting new standards for what a modern online casino should look like. This site has already picked up countless industry award, but they had best make room in their trophy cabinet for a gorilla-shaped statuette which is coming their way! We love the range of games on offer here, new and classic titles from first-rank developers. There are hourly slot tournaments with tons of free spins on offer as prizes to keep the excitement levels high. Plus, you have the imaginative journey that players go on through the world of Casumo as they earn rewards for playing. 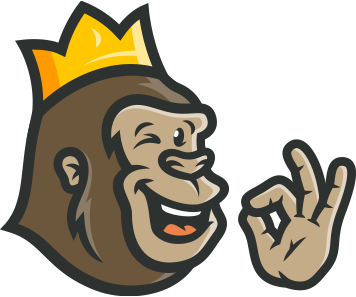 There was only one possible winner this year in the Best Online Casino category: we would have had one angry gorilla to deal with if it had been anyplace other than Casumo. Casumo was the winner of the main prize for 2019, but we also want to recognize the best of new casinos in these awards. With that in mind, it was impossible to look past Casimba Casino as the winner of the Best New Online Casino for 2019. Why did the 600-pound-gorilla make them the pick of the new crop? Start with a welcome bonus of an incredible £6,500 plus 125 free spins – that was enough to keep even the Casino Gorilla quiet (for a change). Add to that the more than 500 games on offer from some of the biggest and best game developers in the world, and it makes Casimba streets ahead of the competition when it comes to the best new casino for 2019. About ten years ago, whether a casino looked good on a mobile phone or not was a very minor concern. These days it’s absolutely crucial to be able to play with a casino from your smartphone, and those online casinos which don’t cut the mustard will get left behind in a hurry. One casino which is certainly on top of their mobile game is Rizk. No surprise really, as this is a forward-thinking casino which has regularly been setting trends since launching in 2015. Rizk is a superhero-themed casino where spinning the ‘Wheel of Rizk’ determines just how much of a bonus you will earn. People who play at casinos aren’t afraid of a bet, so why did it take so long for an online casino to figure out this fun way of rewarding their players? Rizk has also got a superb collection of games from developers like NetEnt and Microgaming, and a huge number of games are fully compatible with all modern mobile devices. For those reasons nobody was going to argue with the Casino Gorilla when he nominated them for the award. Mr Win Casino doesn’t qualify for best new casino, as it was launched in 2017. However, it has won the coveted award for Best Live Casino for 2019 and when you pay a visit you will understand exactly why. The Casino Gorilla started playing in the Mr Win live casino at about 8 o’clock in the morning, and it took a lot of persuasion and a delivery van full of bananas to persuade him to stop playing at 6pm so that we could shut down the office. We have never seen a larger live casino than the one on offer from Mr Win – and we’ve seen a whole lot of live casinos. There are over 80 (yes, eighty) tables to choose from here, with games including: blackjack, roulette, baccarat, stud poker, casino poker and dice, plus multiple variations of those games. No fewer than eight different providers have pooled their resources to create this awesome live casino, making it the best one out there right now in our opinion. There have been so many great games released lately that it was quite a head-scratcher for the Casino Gorilla as he tried to choose a winner. Luckily, if there is one thing he excels at (besides online casino gaming) it is scratching, and he eventually came up with a winner we could all agree with. The prize for Best Slot Game 2019 goes to Viking Runecraft from Play’n GO and after you’ve played it you will see why. Instead of a standard slot game with the usual 3 x 5 set of reels, Viking Runecraft offers you a completely different gaming experience. You are presented with a large grid of symbols, and score wins when clusters of 5 or more appear together. Clear the grid to display hidden patterns to level up and gain the assistance of Norse gods to help you on your journey. This is a wonderfully immersive gem of a game which needs to be played to be believed. There is always a lot of competition for the award for the Best Casino Game Provider every year, and 2019 is no different. Playtech and Yggdrasil were two developers worthy of serious consideration – and there were many more besides and much arguing in the office as to who deserved the top prize. As usual, the final decision fell to the Casino Gorilla himself – only fair as the trophy is in his likeness – and it was hard to argue with his choice of Net Entertainment as the 2019 winners. NetEnt has long been regarded as one of the industry’s top game providers, and year after year they continue to deliver quality games that people love to play. This is the developer responsible for all-time classics like Starburst, Gonzo’s Quest and Mega Fortune, and this year’s releases certainly have not disappointed. To give you a flavor, so far in 2019 NetEnt have released Twin Spin Deluxe, Asgardian Stones, Archangels: Salvation and Universal Movies: The Phantom’s Curse. And there are plenty more to come down the track – undoubtedly a worthy winner.